$16,000 yearling sale purchase Taxmeifyoucan proved too elusive for his competitors in the $500,000 Restricted Listed Inglis Guineas at Scone on Saturday, generating euphoric scenes in the mounting yard from his large group of owners. Taxmeifyoucan ($16,000 2011 Classic, 3g Ad Valorem-Tis Hopeful settled midfield in the rich 1400m event and given a clean run down the centre of the straight by jockey Blake Shinn the gelding dashed away to a one length victory over Group 3 winner Lunar Rise, with second emergency Chewychop back in third. Trainer Greg Hickman had to hold back the tears when interviewed after one of his training careers biggest moments. “It means as much as any win I've had but it's also great for the owners, there are new owners and long-time owners in the horse and anything like this means a lot,” said Hickman. Hickman purchased Taxmeifyoucan from the 2011 Inglis Sydney Classic Yearling Sale because the youngster shared similar looks to $800,000 earning Group 2 winner Sportsman, which Hickman purchased for just $8,000 from the Classic Sale. "When I looked at him [Taxmeifyoucan] he reminded me of Sportsman, he was a nice leggy little black horse, much like Sportsman. I just liked the look of him,” Hickman recounts. There was good reason for Taxmeifyoucan’s owners to give their horse three cheers as he came back into the mounting yard before bursting into song, as the gelding had just netted $300,000 in first place prizemoney. 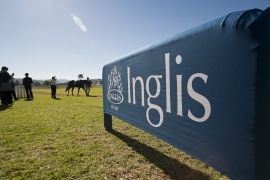 This was the fourth running of the lucrative Inglis Guineas, which marks the end of the Inglis Race Series for horses purchased at Inglis’ Select Yearling Sales. Previous winners have been Pampelonne ($140,000 Easter), Sincero ($8,000 Classic) and Star Of Octagonal ($23,000 Scone). 2011 Inglis Select Yearling Sale graduates such as Taxmeifyoucan to win Inglis Race Series events over the last 18 months include Diamond Earth, Cavalry Rose, Snitzerland, Red Excitement, Edgewood, Murcielaga, Elkaydee, Tinszelda, Under The Leaner, Proper Madam, Specific Choice, Soapy Star, Road Trippin and High Esteem. The $50,000 Trainers Bonus that is awarded to the trainer with the most wins in each Inglis Race Series has been split four ways for the just completed season for 2011 sale graduates. Greg Hickman, Anthony Cummings, Gerald Ryan and Neville Layt all recorded two wins each. Cummings’ two wins were recorded by Diamond Earth ($60,000 2011 Classic, 3f Choisir-Face of the Earth in the $250,000 Inglis Banner and $250,000 Inglis Nursery as a two-year-old in late 2011. The filly recorded her fourth career victory earlier on Saturday afternoon when winning the Listed Denise’s Joy Stakes at Scone. The win in the 1100m black type event took Diamond Earth’s earnings past $600,000. Satin Shoes ($700,000 2010 Easter, 4m Flying Spur-Star Satire then completed a great two days in Scone for Inglis yearling sale graduates when she won the Listed Ortensia Stakes over 1100m. Big crowds flocked to both days of the popular Scone Carnival. Many were on hand on Friday to watch Speediness and Sweet Serendipity claim the $200,000 Listed Scone Cup and $100,000 Inglis Challenge respectively. Speediness ($18,000 2009 Premier, 5g Testa Rossa-Fine Glass) finished second to Sincero in the 2011 Inglis Guineas at Scone and the familiarisation with the track paid big dividends this year with the enigmatic galloper taking his earnings to $480,000 when winning Friday’s 1600m Scone Cup over Mouro and Kaypers. Sweet Serendipity ($9,000 2012 Scone, 2g Excites-Sweet Rory) netted more than six times his yearling sale purchase price when taking out the $100,000 Inglis Challenge by nearly three lengths from Rock My Fuji and Husswick. The Inglis Challengeis part of the $5million Inglis Race Series. A 1100m two-year-old set weights event held on Scone Cup Day, the race is restricted to graduates of the Inglis HTBA Scone Yearling Sale that are paid up for the race series. The 2013 Inglis HTBA Scone Yearling Sale will be held at White Park tomorrow, Sunday 19 May. 193 lots have been catalogued for the sale which will begin at 10:30am. All yearlings to be offered will be available for inspection early on Sunday morning. The catalogue can be viewed online at www.inglis.com.au and on the Inglis Sales iPad App.